Hey guys, just seeking some clarification on the approach to these climbs. My buddy and I scouted this out last weekend, we bushed bashed our way up from the taped tree at the road, until eventually we came across a first and then a second cairn stones (didn't see the yellow tape on the way up, but did see it on the way back down - might take some fresh tape if we go back). The second cairn we found was on a larger rocky outcrop, a few metres to the left of which is a small section of slab, which does seem to join into the main slabs further left following a string of shrubs left and down but seems to just lead into a gorge. We couldn't see any beginnings of any lines here? Also not sure if it qualified as being a twist of dead wood as in the approach description. Anyway we followed up this mini-slab, say 4 - 6 metres and then kept moving up before giving up not seeing any other obvious direction and wondering whether we were too high or not high enough. At this stage we gave up and came back down past the two cairns and yellow tape back to the road. Can anybody provide any clarification of when to actually move left to gain the slabs and the start of the climbs (Noblesse Oblige etc.)? Obvious landmark? Any more cairns? The tape and cairns are mostly my work, but as you acknowledge there's not much in the way of landmarks around there. Plus with all the rain we've had that tends to cop a fair bit of runoff which may well have destroyed some cairns and altered any landmarks. Sounds like you were on the outcrops to the right side of the main watercourse. A "mini-slab" could mean a number of spots, but I suspect if you'd come up a bit more then traversed left you'd have been able to get across into Count of Mounting Crystals. My recollection was if you traverse left a bit lower into the watercourse/gully you end up soloing up some easy slabs (but no easier than some of Nobless Oblige!) and to a large tree on your right then stepping down gets you below Noblesse. I'll try and dig some old photos out over the next few days to refresh my memory and post something up. Hope that helps. Noblesse Oblige is fairly obvious when you get to the base. Especially if you check it out again the VCC photos from further up the road. But it does take longer to get to the base than you'd expect. I was starting to think we'd overshot by the time we found it. 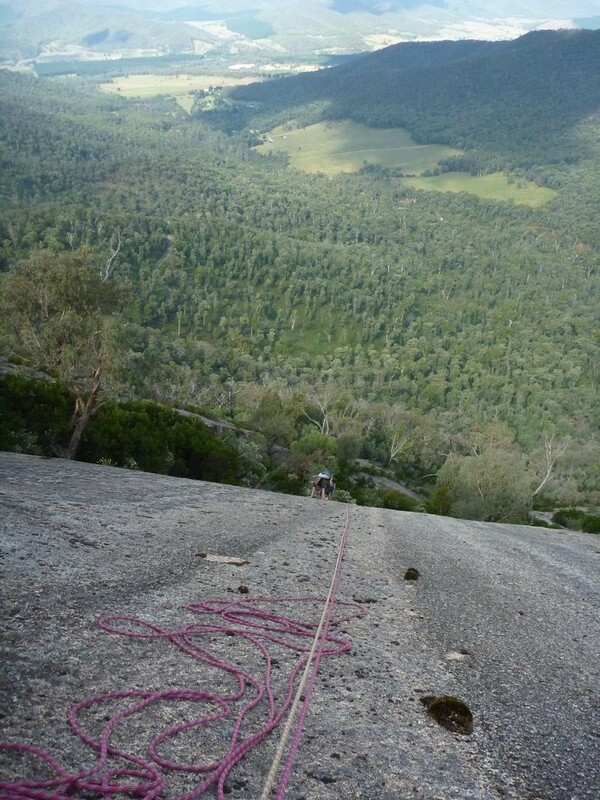 We scrambled (soloed) up a number of easy slabs before getting to the base of the climb. I think we went left too early according to the guide, but it was nicer to climb a bunch of easy slabs (in and left of the gully) than it was to bush bash any further up the ridge. Steve, thanks - it'd be great to be armed with a little more insight before attempting another approach. I tend to agree with shiltz's post, though have found that if you trend left too early that you will end up in the creek-line, which if dry provides for some very polished slabbing up to the 'normal start' of NO. The bush-bash varies depending on how the regrowth is going after fires etc, but I've not found the cairns to be particularly helpful anyway. The first couple are kind of obvious as to the line of least resistance when looking ahead, and after that by the time you see one you are tripping over it! Later in the season the ill defined track is more discernible due to greater usage of it. You traverse left onto easy slabs then head up and R till the buttress steepens. Then decide that climbing is just as hard as walking and has less stigma attached to it..
>my memory and post something up. Hope that helps. "Old photos?!$%!. Surely GFDonc could be providing precise GPS coordinates with an optimised route plan. Seriously, phone technology and apps are good enough these days to be able to provide accurate enough GPS references to be able to navigate to and locate the base of a climb. Precisely locating a few key climbs as reference points on larger remoter cliffs would save a few people a lot of time and anxiety about whether they were starting in the right spot. It would be good selling point for a guidebook on obscure cliffs in the Grampians, eh GF! For the large number of cliffs with phone reception you could make good use of this without even needing a separate device. I'd imagine most of Mt Buffalo would be in that category. Without phone reception a lot of people could still utilise their GPS sports watch before taking to the last resort of buying a small hand-held GPS for the price of a big cam. The Crag does have the facility to add a location for each climb, but it would also be handy for other reasons to know if an area/location also has phone reception. I will try to remember to record these things next time I find myself a-hunting. Yeah, yeah, hassle me ..
this sitting around on a web server. It's the FA of Count of Mounting Crystals (guess I ran it out a bit to the belay). Noblesse starts on the slabs to the right of the climber I think, and the tree I mentioned is probably the distinctive white-barked gum on the right of the photo. Old topo here. Noblesse is in purple. This doesn't show all of CoMC, the yellow line covers most of it with Geoff's Good Luck and Good Management finish. >time I find myself a-hunting. I've noted phone reception against a few crags though that not sure how useful that info will be for people with No or Neverphone and other providers not connected with Tell-someone-who-cares. At least 000 will work with any provider. 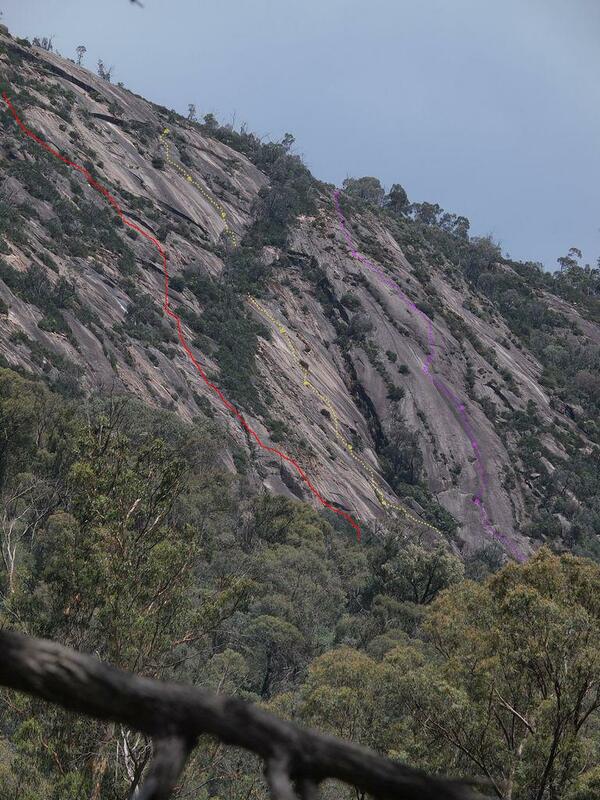 I've been recording #of bars against the central grampians crags. Only for Telstra though, I think the others would be a waste of time. There are 12 messages in this topic.